Can we really reduce the cost of maintaining a building? Given the annual total cost of keeping a building safe and usable, especially aging buildings, the amount spent on operation costs can be a princely sum. Investment on building maintenance represents almost half of the total turnover of the construction industry and such a reduction of resources has a direct effect on a nation's economy. Recent studies have shown that the main factors that lead to building operations and maintenance problems are due to faulty design, faulty construction, financial factors and maintenance related defects. The lack of maintainability considerations during the design and construction stages lead to building defects which accounts to billions of dollars expenditures throughout the building's lifecycle. More so, the potential unsafe conditions of buildings (specifically on high rise building facades) can be more detrimental to the lives and health of construction workers and may jeopardise public safety and surrounding properties if remained unaddressed. Thus, the design for maintainability is established from the standpoint of the design itself to ensure the benchmark and quality of design, construction and maintenance practices for high maintainability of buildings. 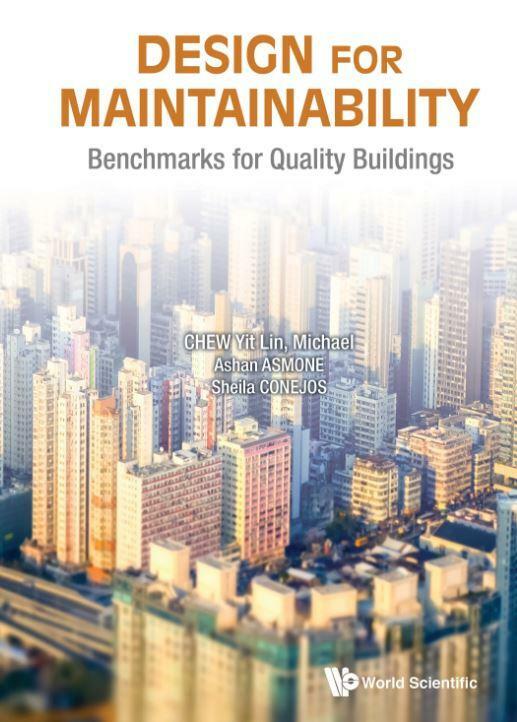 Responding to calls from developers and building professionals, Michael Yit Lin Chew, Ashan Asmone and Sheila Conejos (National University of Singapore) authored Design for Maintainability: Benchmarks for Quality Buildings. The book focuses on spearheading the integration of designers, constructors and facility managers (FM) on the outset of the planning/design stage easy to read tables summarising knowledge learned from past mistakes and maintainability benchmarks. The book is organised by the six major building components: (1) basements, (2) wet areas, (3) façades, (4) roofs, (5) common areas and (6) M&E systems. Each chapter addresses the common defects and the corresponding design, construction, or facility management issues, with standards, guidelines and recommendations for the structural, architectural and services of the component, to be taken into account at the outset of the planning/design stage. Building maintenance shares a significant portion of any building's operational cost and it is gaining increased awareness that improved maintenance performance can be used to add value to the business process. Thus, "to complement Singapore's goal to achieve sustainability through greening its built environment, considerations for the maintainability of new buildings at the design stage is critical" says lead author, Prof Chew. This book retails for US$38 / £33 / SGD56 (paperback) at major bookstores. A hardback edition is also available at US$58 / £51 / SGD86. To know more about the book visit http://www.worldscientific.com/worldscibooks/10.1142/10722. Michael Chew Yit Lin is a full professor in the Building Department at the National University of Singapore (NUS), in the School of Design and Environment. He has been the principal investigator of many research projects and has been successful in attracting external research funding, with a total project value exceeding $3m. He has authored more than 200 publications and is the author of 5 books which have been recommended as texts in many overseas and local institutions. His R&D on joint sealant testing and product development, and his work on the maintainability of buildings, has resulted in two patents awarded in US and two in Singapore. He has seen his products licensed and commercialised, with his R&D brought from the laboratory to on-site applications including airports, buildings and civil structures both locally and overseas. He is the founder of an NUS spin-off company–Building System and Diagnostics Pte Ltd, incorporated in April 2003. Ashan Senel Asmone is a doctoral candidate attached to the School of Design and Environment at the National University of Singapore (NUS) who has majored in facilities management and who holds a Master's in environmental management. He has years of experience in building-related research in sustainability and maintainability and has several publications to his name. Ashan's experience prior to joining the NUS maintainability research group as a research scholar includes work experience in the facilities management industry, and as a lecturer in academia. Sheila Conejos is a Research Fellow in the Building Department at the National University of Singapore (NUS). She earned her PhD in Architecture and Sustainable Development in Australia and has studied in the Philippines, Thailand and Japan under various international postgraduate scholarships. She is a practicing Architect and Urban Planner and managed her own consultancy firm prior to joining the academe in Australia and Hong Kong. She has extensive research and industry experience and has published a number of international referred journals related to building and urban sustainability. World Scientific Publishing is a leading international independent publisher of books and journals for the scholarly, research and professional communities. World Scientific collaborates with prestigious organisations like the Nobel Foundation and US National Academies Press to bring high quality academic and professional content to researchers and academics worldwide. The company publishes about 600 books annually and 135 journals in various fields. To find out more about World Scientific, please visit http://www.worldscientific.com.